The Kinnaird Ravine is a beloved escape into nature for the Parkdale and Cromdale neighborhood, providing a path for runners, walkers, dogs, cyclists, and more. In 2015 a project called “Kinnart” Ravine Community Outdoor Art Gallery was given permission by the city to replace the previous graffiti in the Ravine with plywood murals painted by members of the community. This centerpiece has been enjoyed by many and its existence is something we at Parkdale Cromdale Community League hope to continue. Some of you may have noticed the disappearance of these murals and we wanted to provide an update on what exciting things we have brewing in regards to the ravine. The city had agreed to give permission to our mural project for five years, which we hope to have extended in order to change the artwork every three years. We have decided to replace the murals in this timeline not only due to the wear and tear the environment can have on the murals, but because of the chance it provides the community to come together and paint. This is an opportunity to get to know the organizations and people in our city and in our neighborhood through the connection of art. During our mural take-down day (special thank you to Sebastian Barrera, Steven Townsend, Richard Williams, Taylor Wood, and our summer students) we unscrewed all the murals and took them back to the league to sand and prime. Now that they are being primed, we have hosted a Mural Painting BBQ on July 28th and will be doing so once more on August 25th from 11am to 5pm. This will be a fun event where we paint some of the murals in the rink behind the community league while enjoying music and free food! Learn more about the event here and RSVP through our website or our Facebook event page. Throughout the next two months, we will continue to work on these murals and hand them out to different artists and organizations to paint together. Once they are finished, we will take a day to return them to the Ravine and put them back into place for everyone to enjoy all year long. If you have any questions or concerns about this project, please let Sebastian Barrera know at cbastianb44@gmail.com. 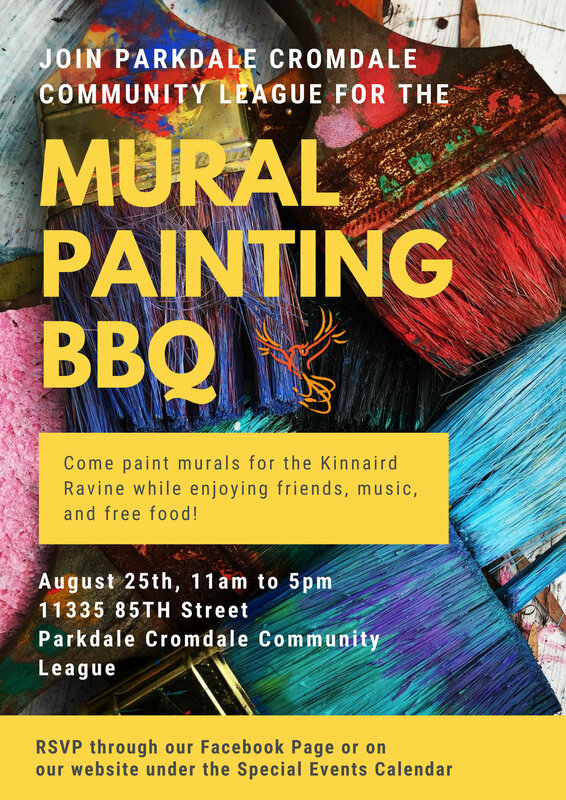 We want as many people involved as possible to ensure a variety of art and connections are made, so let us know us if you have an organization that would like to paint a mural and make sure to stop by our Mural Painting BBQ on August 25th!